As we take up the reins of American Short Fiction in 2013, we find ourselves repeatedly touched and honored: not only by the journal’s impressive history—its record of stories anthologized in Best American Short Stories, Best American Non-Required Reading, The O. Henry Prize Stories, and the Pushcart Prize: Best of the Small Presses—but by the amount of respect, warmth, and goodwill awaiting the magazine upon its return, which speak volumes for the talents of our predecessors. They’ll even be at AWP, so you can welcome them back in person. Submissions that were pending before the hiatus will still be read, according to a thread on the magazine’s Facebook page. Yesterday I took the plunge, threw down $175 that I didn’t really have, and signed up for the 8-week Online Fiction Workshop run by Dave Housley of Barrelhouse. Consider this my attempt to bridge the gap between my not pursuing an MFA (since I have no desire to teach) and my itch to inject my game with the twin doses of seriousness and perspective that comes with having your work torn apart by other (perhaps more established) merciless (perhaps even spiteful) writers who know they are doing. Barrelhouse is a fun journal run by cool, down-to-earth people (or so they seem)—in addition to Housley, the masthead includes Mike Ingram and Tom McAllister, known for their always-entertaining Book Fight!/Writers Ask podcasts. I can’t wait to get started. 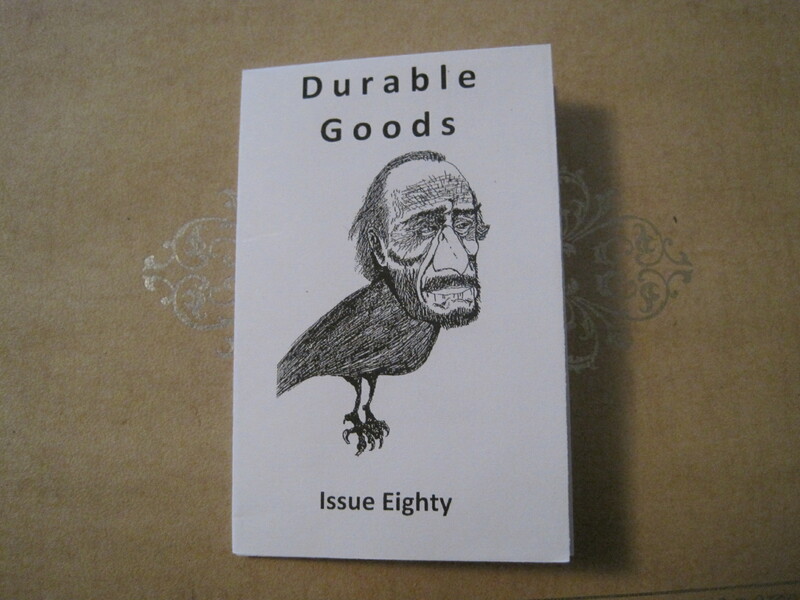 Happy to have a new story, “Our Place,” featured in Durable Goods #80, a delightful foldable microzine, which arrived in the mail this weekend. Alongside poetry by Lori Desrosiers (Western Mass. represent!) and awesome cover art by Andrew Post. Thanks to editor Aleathia Drehmer for letting me be a part. Triburbia, Karl Taro Greenfeld. A splendid, fun read to start off the year, about interconnected families living in gentrified Tribeca. The story “Fun Won,” which I read in Harper’s and wrote about here, makes up most of one chapter, and is the reason I wanted to dive right into this one after I received it as a Christmas gift. Amber, daughter of Rankin, bullied in school by Cooper. And I know I am missing a few. The book is constructed in the same novel-in-stories style that defined Tom Rachman’s The Imperfectionists and Jennifer Egan’s A Visit From the Goon Squad (of which the electric prose of “Fun Won” reminded me); the picture gets sketched in from different camera angles, one chapter at a time, to portray a three-dimensional urban neighborhood once friendly to families and creative professionals with sub-moderate to above-average incomes who are soon to be priced out by wealthier types who merely want to pay for the bohemian allure. Ah, an older boy. His appearance in the loft, blond-haired, sleepy-eyed, in button-up blue shirt, slim-cut selvage denim, and Converse sneakers, seemed to Cooper a manifestation. Had he been here all along? “Miro—Cooper goes to school with you,” Miro was told by the photographer. Cooper looked at the photographer, with his crazy gyrating limp, his somewhat effeminate manner; he didn’t seem to her like other dads, but she guessed he was Miro’s dad. Cooper gazed at him hoping he would recognize her: surely even the fifth-grade boys must have noticed her. Miro, though, merely flopped on another of the many sofas in the room and started doing something on his phone. But when they were finished with her test shots, Miro asked her if she wanted to draw, and Cooper loved drawing. She looked at Sadie, who looked at the photographer, who shrugged and said sure, though he wondered if it might be weird for Cooper to see the other girls coming in for their go-sees. Sadie assured him that Cooper wasn’t the type to be bothered by that. Other Kinds, Dylan Nice. From SF/LD, the book imprint of Hobart, comes this exquisite collection of stories the size of a prayer booklet, which makes it the perfect book for carrying in your pocket and getting caught reading on public transportation. The nine stories are grouped in threes and all have sensitive, keenly observant male protagonists whose active social spheres contrast with their inner aloneness. The plots are minimalist, almost mumblecore-like, but the narratives are not. John Updike Review, 2011. When the John Updike Society launched in 2009, I immediately signed up and sent the required dues, even though I didn’t have much to contribute on an intellectual level other than my deep fondness for Updike’s books, at that. I was simply happy it existed. After the folding of The Centaurian, the helpful site run by James Yerkes, in 2009, there hadn’t been a sole reliable place on the Internet to turn to for information on my favorite author. For my contribution I received a lapel pin (with a drawing of Updike’s face) and a subscription to the John Updike Review, an annual peer-reviewed critical journal edited by James Schiff and published by the University of Cincinnati. The first issue of JUR does a good job of covering varying aspects of Updike’s work—not necessarily an easy task given the man’s range of interests and sheer voluminous output. (A read through his collections Hugging the Shore or Due Considerations would lead one to think that Updike never turned down an assignment no matter how far afield.) The selections are also very readable, not weighted down by academic jargon or theory. The authors’ joy in reading Updike comes through with the questions they ask to understand his work better. Since this is the first issue, there are a lot of Why-are-we-here moments to get out of the way, including “John Updike’s Sense of Wonder,” Ann Beattie’s keynote address delivered at the First Biennial John Updike Society Conference (in Reading, PA), as well as J. D. McClatchy’s tribute for the American Academy of Arts and Letters and a eulogy from Updike’s son David. I enjoyed “Updike and Kerouac: Rabbit on the Road,” by Donald J. Grenier, which reminds us that Rabbit, Run was conceived by Updike in part as a response to On the Road (published the same year that Eisenhower’s Interstate Highway System was put into effect), asking the question of what happens to the people left behind when a young man puts wandering urges before his responsibilities. I also enjoyed “’The Bright Island of Make-Believe’: Updike’s Misgivings About the Movies,” by Peter J. Bailey, an argument that sources Updike’s fiction and criticism with equal weight to portray a writer’s suspicions of the Hollywood machine. One of my someday projects is to attempt a wholesale annotation of the Rabbit novels, starting with Updike’s use of alliteration in the first line of Rabbit, Run that is meant to echo the bouncing of a basketball, as well as Janice’s sweet tooth (she puts sugar in her old-fashioneds) in contrast to her husband’s taste for salt. The Way the World Works, Nicholson Baker. Baker’s second essay collection lacks the unity and serendipity of his first, The Size of Thoughts, but is still an enjoyable read. In fact, Baker’s essays are on the whole probably better than his fiction; for one thing, they do away with the mere shadow of a thoughtful protagonist on which to hook narrative, and rely instead on an already-established, complete, and fully reliable one: the author himself. The ‘War’ section includes three essays that feel like they were written in order to justify, or at least accompany, Human Smoke, Baker’s line-by-line retelling of the facts leading up the U.S.’s decision to enter World War II. A short essay near the front of the book, “Why I Like the Telephone,” may have been my favorite, not least for what it achieves in showing off Baker’s ability to bring forth the wonderment in how we visually and aurally receive things, like dial tones. Big Fiction # 3, Fall/Winter 2012. As its name implies, this journal out of Seattle focuses on longer works of fiction, which as a submitting writer I have found to be a thin market, in that window of length beyond the threshold of Internet readability, but hard to get published in print, where space is at a premium and journals are understandably reluctant to devote so much of an issue to a single author. Even better, the volume is published in exquisite hand-designed letterpress. Three stories make up the issue. A lot of attention will probably be paid to the longest of the three, Mylene Dressler’s novella “The Wedding of Anna F.,” as it concerns an elderly character who believes herself to have “recovered” the life of Anne Frank. Elderly characters don’t get a lot of love in fiction for a number of reasons, not least of which that they are hard to write about reliably, since the authors writing about them often haven’t reached the age of the character. How do you convincingly place yourself if the shoes of someone who’s at an age you haven’t lived at yet? And the ones we do see get played off much younger, dynamic counterparts: I think of the Lee Krasner-modeled Hope Chafetz in Updike’s Seek My Face and Leonard Schiller in Brian Morton’s Starting Out in the Evening, both the subjects of ambitious students eager to pin down the elders’ lives and work for some boxed-off, line-item accomplishment. The common practice is to portray older folks as limited, doddering, reminiscent, and not so eager to advance the conversation. Outside of a few small moments, Dressler mostly avoids this technique, and the use of flashbacks help to break up the long conversation. Dressler’s story should not overshadow the two smaller ones leading up to it: Eric Neuenfeldt’s “Telegraph Pine” and Molly Bonovsky Anderson’s “The Bricklayer’s Club,” both with convincing male protagonists looking to rebuild their self-worth after falling into despair. You are currently viewing the archives for February, 2013 at Neil Serven.